PureAyre's pure and powerful all-natural formula lets you get rid of pet odors without the dangers of chemicals, bacteria or alcohol. It's strong enough to get rid of really bad smells like cat urine and even skunk, yet safe enough to spray directly onto people and animals! Because it's all natural "food-grade", you can even use it around birds and exotic pets. 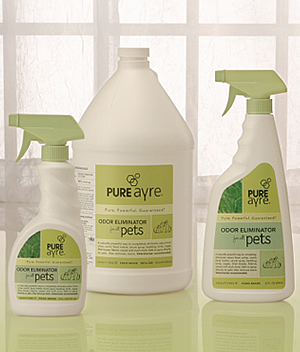 PureAyre is also the most versatile pet odor eliminator you can buy. You can fog it, spray it onto furniture, mop it onto floors, wash laundry with it, add it to your carpet cleaner, and even use it to remove stains. Pureayre is safe to spray directly on pets. Also removes stains.